The number of properties for sale are close to historic lows, says the Royal Institution of Chartered Surveyors (Rics). The professional body says new properties being listed have fallen for 10 of the last 12 months. Despite this it said house price growth slipped to its slowest pace since May 2013 as the number of buyers fell. Rics singled out London as the place where more surveyors reported prices falling than rising. Elsewhere the picture varied widely, with strong growth in Northern Ireland, Scotland and North West England. Rics said stamp duty changes in England and Wales were having an impact. It said that the recent changes would support demand for the lower end of the market since the changes cut the tax for these types of home. The Chancellor, George Osborne, has said the new system would see 98% of buyers pay less and only people who buy homes worth more than £937,000 will pay more in tax. Rics said its members expected the Stamp Duty reforms would boost sales and prices by between 2-5% in much of the country, but in London would dampen sales by between 5-10% and dent prices by between 2-5%. It said however, that prices were unlikely to fall, saying that scenario was "implausible". It also said that if demand began to improve from these flatter levels increased competition could prompt a rapid rise in prices. A balance of 11% more surveyors said they had seen house prices generally rising than falling in December, but in London that view was reversed, with an overall balance of 36% of surveyors seeing values falling rather than rising. In Wales, a balance of 6% of surveyors saw prices going up rather than declining. In both the East and West Midlands this figure was 9%. In the South West it was 16% and in the South East it was 24%. 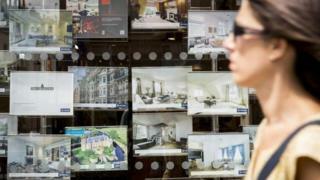 Rics said that the number of potential buyers entering the market had now fallen for six months in a row. Rics' chief economist, Simon Rubinsohn, said: "There is a risk that with so little housing available, any pick-up in demand could rapidly feed through into higher prices rather than higher sales." He also said the forthcoming general election was beginning to create uncertainty.